President Kennedy lashed out at Republicans for cutting $585 million from the foreign aid bill. He termed the action "unprecedented, unwarranted, and unwise, and one that will critically affect our strength at a time when the forces of freedom are moving around the world. It is a shocking and thoughtless attack by the Republican leadership on a program which both parties have consistently supported as being vital to our national security." 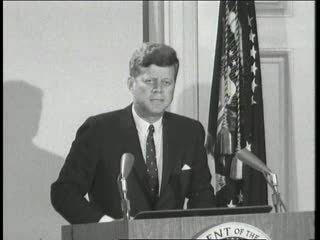 Chicago: “Vietnam: A Television History; JFK Attacks Republicans for Slashing Foreign Aid,” 08/23/1963, WGBH Media Library & Archives, accessed April 23, 2019, http://openvault.wgbh.org/catalog/V_4D255DA9B3D14CF0AD36B596C181535A. MLA: “Vietnam: A Television History; JFK Attacks Republicans for Slashing Foreign Aid.” 08/23/1963. WGBH Media Library & Archives. Web. April 23, 2019. <http://openvault.wgbh.org/catalog/V_4D255DA9B3D14CF0AD36B596C181535A>.